After countless mishaps in controlling and monitoring the huge steel tanks that store waters with different degrees of contamination - from water with hardly any contamination (rainwater, water drawn from the wells for the underground water bypass plan) to water with extremely high beta nuclides (waste water after SARRY/Kurion and desalination) - and countless promptings from Nuclear Regulation Authority commissioners, TEPCO installed water gauges to all 1000 tanks. The water gauges are monitored in a room dedicated to monitoring the tanks, using a PC. On April 8, TEPCO quietly announced that alarms went off on two of the tanks, without the staff in charge of monitoring (TEPCO employees) noticing the alarms for two hours. They turned out to be false alarms, and there was nothing wrong with either tank. Now, why didn't the workers hear the alarm? Then on April 9, TEPCO further admitted that there were not just two but 433 tanks whose alarms on water gauges were turned off. Why? Because someone had turned off the sound on the PC. This has got to be one of the lowest level of (non-)performance, even for TEPCO. But hardly anyone pays any attention any more to anything happening or not happening at Fukushima I Nuclear Power Plant, and even the NRA commissioners seems resigned to the fact that nothing they say or suggest to TEPCO will be fully heeded by TEPCO anyway. Chairman Tanaka, in recent press conferences, reportedly said "TEPCO is just that, that kind of company..."
Alarms on water gauges on 433 tanks that store contaminated water were "off"
TEPCO revealed on April 9 that the water gauges on 433 tanks out of 1000 tanks that store contaminated water at Fukushima I Nuclear Power Plant had been set so that there would be no sound even if an alarm was sounded to indicate abnormal water levels. On April 8, some water gauges malfunctioned and alarms were issued, but since there was no sound [the workers] didn't notice for two hours. According to TEPCO, an alarm goes off when the water level rises or drops rapidly. However, the sound of the PC that controls all water gauges was set "off". When the highly contaminated water leaked in February this year, the alarm did go off. TEPCO believes the sound setting was changed to "off" after the February incident, and says they are investigating whether the sound was turned off by mistake. My guess is that there were so many false positives that the workers couldn't stand the alarm noise and turned off the sound on the PC. 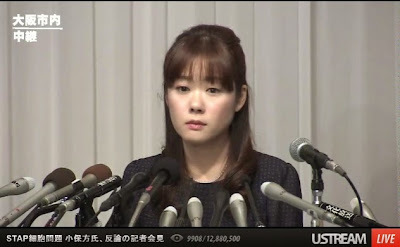 Having already hired not just one or not even three but FOUR attorneys in preparation to fight her employer Riken, the prestigious research institution in Japan who has in fact re-hired her with taxpayers' money ($150,000 a year, I hear) as of April Fools' Day, Ms. Haruko Obokata is holding a press conference in Osaka with more than 200 reporters attending. The 30-year-old PhD (for now, until Waseda University strips her of the doctoral degree) is fully employing the girl-like charm with blank stares, shifting eyes as if she is about to cry for an effect, well-coiffed old-fashioned hair style, and is speaking like an elementary school girl who is trying hard to make excuse for her bad behavior or missing homework. "Poor me! Look at me I'm suffering!" "STAP cell phenomenon is truth, I have encountered it many times. Just because my paper was not well-prepared, why should STAP cell be denied?" Well, a total fiction can be truth, as a female novelist from nearly 1000 years ago in Japan wrote in her phenomenal Tale of Genji. Your paper, which you wrote with the vice president of Riken and your Harvard University professor (Mr. Charles Vacanti, an anesthesiologist), is full of borrowed and photoshopped photographs and borrowed texts without attribution. The key photograph that was supposed to prove the existence of your STAP cell was copied and photoshopped by you from your own doctoral thesis at Waseda University. I couldn't stand to watch the press conference (live on USTREAM right now) any longer. It has devolved into tabloid news. "There is no photograph that shows what does not exist, therefore it is not a fabrication," Obokata just said. She is no scientist, and the Japanese media is no scientist. They deserve each other. "I don’t think STAP cells exist and it will be a waste of manpower and research funding to carry on with this experiment any further. " Meanwhile I haven't heard any news about Nature Magazine investigating its "peer-review" system, or about Harvard University investigating Professor Vacanti's lab.